The method of steel processing uses the primary slag and steel slag as raw material. It takes a set of closed-cycle production process which has processes of screen, pressure ball milling, dry-type magnetic and wind classification etc. And it can gain four kinds of highly efficient, high -quality and high value-added products that are high-quality scrap steel with iron content more than 90% and can be used for steel-making , the high-grade iron powder for smetling steel, steel slag powder for high-activity admixture of cement and concrete and aggregate for high-grade highways of steel slag asphalt concrete road surface. It acheives the purposes that steel zero emissions and no environmental pollution. A:ball milling It is done in air swept ball mill (5) The particle size of 10 ~ 300mm roughing steel slag Add air swept mill (5) in milling, grinding process in the use of negative pressure operation of the wind, the wind pressure of 2 ~ 10kpa, the wind capacity of 1000 ~ 5000m3/ht steel scrap while grinding, use of negative pressure to the side away powder residue, forced separation of slag and steel. 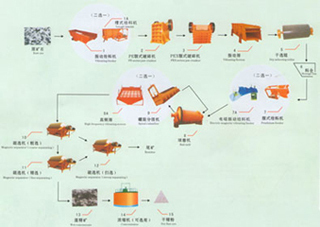 First, separation of the results of Fe with grain size larger than 90% of the 0 ~ 100mm steel scrap, steel scrap into the high-quality database (9), the First, for 0 ~ 1mm size of the slag powder. B:gravity grading Classification of gravity in the sedimentation tank (6) carried out for 0 ~ 1mm size of the powder residue from the air swept ball mill in the settlement after the separation of me (6) gravity in grade, size 0 ~ 0.1mm for Java powder into the powder then capture system, the weight of large particle size of 0.1 ~ 1mm into the dry-type magnetic separator (4), by magnetic separation, the metal iron is less than 0.8% of the magnetic re-entering the dry tailings ball mill (2) in grinding; the rest is iron ore concentrate powder . C: Powder Micro capture dust collector in Tornado (7) and bag filter (8) and will be conducted separate from the weight of gravity classification of small particle size of 0 ~ 0.1mm Tornado slag powder to enter the dust collector (7 ), the particle size of less than 0.074mm which was to capture the collection of powder residue into the high-performance steel slag powder Stores (10), the smaller particle size powder residue into the bag filter (8), the particle size of less than 0.045mm slag powder was also to capture the collection of powder into the high-performance steel products warehouse (10), the above-mentioned powder capture system adopts wind pressure of 1 ~ 3Kpa.